Formby Red Squiirel Reserve at Victoria Road in Freshfield, Formby is owned and managed by the National Trust. The reserve is one of twelve red squirrel refuges in Britain. The site consists of pine woodland, a large stretch of sandy beach and extensive sand dunes. Within the stands of Corsican and Scots pine is a large population of wild red squirrels. The reserve is one of the last places in England where visitors can catch a glimpse of the rare red squirrel. On entering the pinewoods from the car park, there are signposted squirrel walks through the woods and nuts for feeding the squirrels are available at a small cost from the Warden's Office. The squirrels are quite used to people and will come much closer than most wild animals. Paths are marked out by low wooden fences, but there are areas of woodland where vistors may walk freely under the trees. The numbers of red squirrels, once the only squirrel species in Europe, are in decline throughout Britain. The population decrease of our native red squiirel is often ascribed to the grey squirrel which was introduced into England in the late nineteenth century from North America, but the loss and fragmentation of its native woodland habitat has also played a major role. Grey squirrels are better adapted to conditions in the now fragmented British woodland and are better able to digest oak acorns, often in plentiful supply. 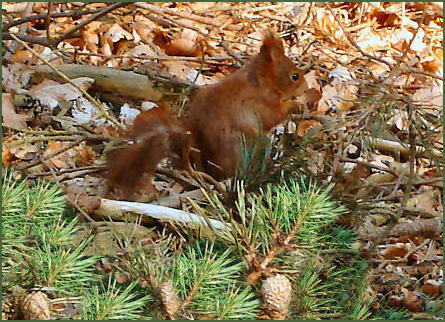 Formby’s red squirrels have made a healthy resurgence over the last few years. The local population plummeted in 2008 due to an outbreak of squirrel pox virus, falling to just 10 per cent of the previous population levels. Red squirrels have little immunity to the Squirrel pox virus, and it is often fatal in the wild. The virus was carried to Britain with the introduction of the greys. The sand dunes at Formby are designated a Site of Special Scientific Interest (SSSI) due to their geological significance, they afford excellent views across the Irish Sea. Blackpool Tower and and on very clear days, even the mountains of the Southern Lake District are visible beyond Morecambe Bay. The dunes are widely populated with marram grass, great crested newts and sand lizards, they are also home to several rare and endangered species such as the Natterjack Toad and the Northern Dune Tiger Beetle. 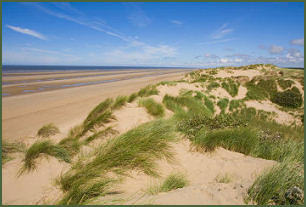 Formby is one of a few sites in England where the Natterjack Toad will breed. Its a nocturnal animal, with a very loud croak that can carry for miles, they are noisiest in winter, when the males 'sing' to attract a mate. The natterjack toad can be recognised by its mottled, warty back, which has a distinctive yellow stripe running down from the snout. They are able to alter the colour of their skin, either lighter or darker, to camouflage themselves into their surroundings. Erosion of the sand has revealed red deer and wild cattle footprints baked into the mud on the beach at Formby. These deposits, with their footprints which have been found since the 1950's and include those of people, red deer, roe deer, auochs (large wild cattle-hunted to extinction in Britain by the end of the Bronze Age), unshod horse, wading birds and dogs/wolves were laid down in the lee of an offshore sandbar somewhere between 3,500 and 6,500 years ago. There is considerable interest in the footprints, recently a set of antlers from a Red Deer, still attached to part of the skull, were also found on the beach. The best way to see them is to attend one of the guided walks offered by the National Trust. Toliets and baby changing facilities are available. From Liverpool, follow signs to Southport until joining the A565. Follow the brown signs from the roundabout at the North end of Formby by-pass.